Professor Layton, everyone’s favourite dot eyed, puzzle solving gentleman! If the DS brand had a mascot of its own, away from Nintendo’s overall Mario focus, it would be hard to think of a better candidate than Professor Layton. 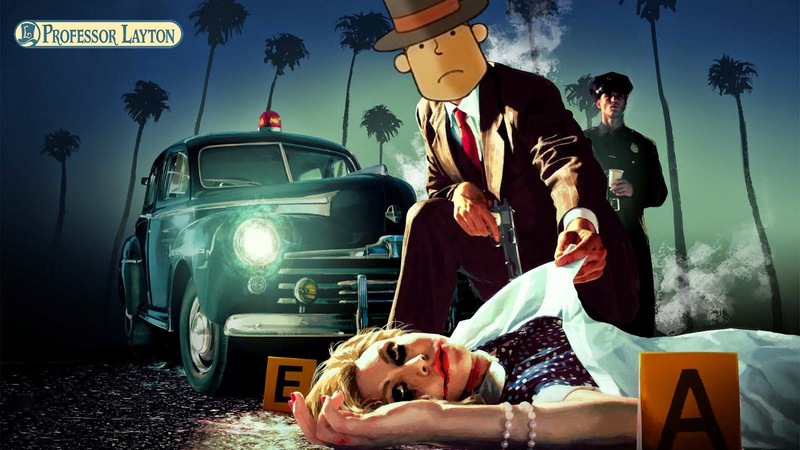 Layton represents the DS brand not only by his large volume of game titles but also by the genre that those games exist in, that of the puzzle game. Portable systems have a long history of being supported by puzzle games, due as much to the lower average computing requirements, as to the pick up and play nature of the genre. The Professor Layton games are a somewhat unusual member of the puzzle game club, because they give as much focus to solving puzzles as they do to storytelling. ‘Professor Layton and the Curious Village’ follows the titular Professor Layton and his “apprentice number one” Luke Triton as they travel to St. Mystere to attempt to solve the mystery of the Golden Apple and end an ongoing inheritance dispute. Upon arriving, the Professor and Luke discover that the village is pretty curious and set out to discover why it is so strange. Reviewing a game such as this comes with the unfortunate issue that everyone playing it will have a different experience based on their ability and speed at solving puzzles, making criticism far more difficult to gauge. Most of the 135 puzzles are fairly good and work well. Having said this, the game has definite problems with a lot of its puzzles, problems which are hard to miss. For starters, many of the puzzles aren’t really puzzles, in the traditional sense. Many of them are simply maths questions, which require knowledge of, for example, how to find the area of a square but aside from having some basic knowledge of mathematics, offer no real challenge. In addition to this, many of the puzzles give descriptions that are purposefully written to be vague and open for interpretation. This wouldn’t be an issue if not for the fact that some of the puzzle questions are just badly written, meaning that emphasis on words or a lack of words in a description becomes impossible to spot. The game has an inbuilt three tier hint system. You use hint coins that you find in your travels to unlock hints for puzzles. The issue is that hint one, and usually hint two are painfully obvious, the first hint is quite often simply, ‘read the question carefully’. In order to therefore unlock hint three, which may actually help you, you have to spend three of the limited number of hint coins. This would not be an issue if not for the seemingly random complexity level of puzzle while progressing through the game. You earn Picarats for completing puzzles, the amount earned being an indicator of the difficulty of the puzzle, in theory. In practise a puzzle worth 20 Picarats may be far harder than one valued at 50 Picarats. The amount of Picarats attached to the puzzles seem almost arbitrary at times, particularly as the game has different types of puzzles which different types of people will find easier or harder. I for example found the wordplay based puzzles far easier than the purely visually based puzzles. The constantly fluctuating difficulty makes the budgeting mechanic of Hint coins somewhat useless. This is additionally frustrating as some of the puzzles are multiple choice and some require a written answer. This means that if you are willing to sacrifice points, some questions can be repeatedly retried at the expense of said points until successful, while other cannot. All this serves to do is to discourage you to seek the non-essential story progressing puzzles when low on hint coins. The storyline essential puzzle and non-essential puzzle system is a double edged sword. You can choose to play additional puzzles while progressing with the story or ignore them and directly progress as fast as you want with the story. This system would work if the puzzles were all of an equal quality, some of the puzzles are not as well designed as others and this quality split is divided evenly between both the essential and non-essential puzzles. This raises the inevitable question when playing the non-essential puzzles of why the good ones aren’t in the main story instead of the bad puzzles and why you would include the bad puzzles as additional content at all? Supporting these puzzles are the story elements which, generally speaking, work pretty well. The story is easy to predict but in a game like this the story is only a small part of the story telling experience. The world and characters inhabiting it are interesting and the way it is presented both graphically and sound wise is enchanting. The story and the puzzles don’t always interact as well as they might, someone will give you an important life and death mission but will want you to count and divide some sweets first so they stop panicking about the plight of some imaginary children they invented. The game makes an effort to explain that everyone in the village is obsessed with puzzles to explain the constant harassment from the locals but that explanation will only hold so much water, water that you must then evenly divide between three different sized cups before you can progress in the story. While playing I was wondering who this game was designed for? The storyline is too in depth for the short pick up and play session audience and too puzzle dense for extended play. I’d be curious to see what the characters of the Professor Layton universe would be like in a more streamlined simple puzzle experience. Reading this back I’m coming across far more negatively about this game than I actually feel. While I feel that everything I have written is true, the overall experience of the game holds together surprisingly well. Presentation is an area it would be very hard to criticise Level-5 in. While the games they develop often have clear flaws, they present the overall experience with such a level of heart and polish it is easy to forgive and generally overlook the flaws. 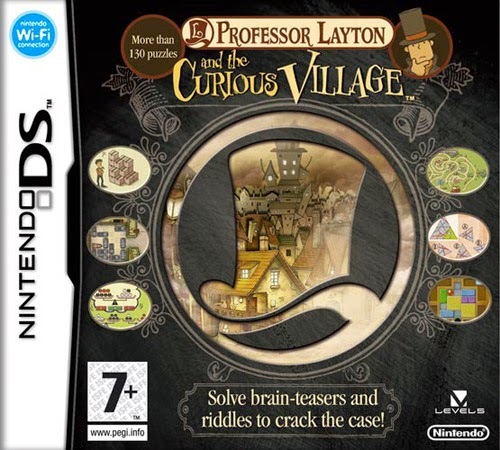 ‘Professor Layton and the Curious Village’ is a flawed experience but a generally positive one, clearly filled with a lot of energy and passion. At the price it tends to be these days it would be hard to not recommend ‘The Curious Village’ as a puzzle worth solving.